Mary and Mario completed a successful trip to Italy in October 2009. In addition to the music tour, their trip included a visit to Mario’s hometown of Assergi. Mario and Mary had the opportunity to visit many villages affected by the catastrophic earthquake that occurred in April 2009. Because of their fundraising efforts here in the United States, Mary and Mario met with a representative from the American Embassy while they were in Rome, and were personally escorted into the city of L’Aquila, where the entire center of the city was destroyed. In the picture above: Mario, Lucia Votano, the Director of the Laboratory, and Mary. While in Assergi, Mary and Mario gave a concert at the Istituto Nazionale di Fisica Nucleare Laboratori Nazionali del Gran Sasso (National Institute of Nuclear Physics, National Laboratory of Gran Sasso Mountain). You can view a clip from the concert below. 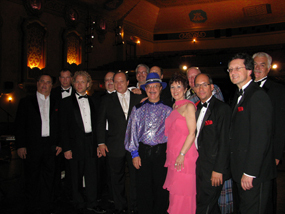 A Benefit concert for the Abruzzi Earthquake Victims was held at the historic Paramount Center for the Arts on Monday evening, June 22, 2009. 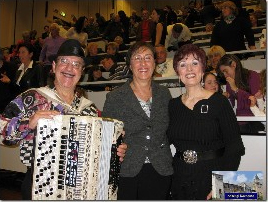 The concert was presented under the auspices of the American Accordionists’ Association. 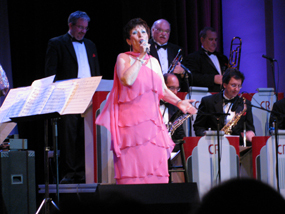 Produced by GIOIA Productions, the musical extravaganza starred internationally acclaimed Vocal Artist sensation, Mary Mancini, and world renowned Accordion virtuoso, Mario Tacca. Joining Mancini and Tacca were Floyd Vivino, comic, and popular radio, TV and movie personality, singer Steve Ritrovato and the dynamic City Rhythm Orchestra. Surprising the audience, Peekskill’s own Bagpiper, Joe Brady, Jr. made a well received cameo appearance. 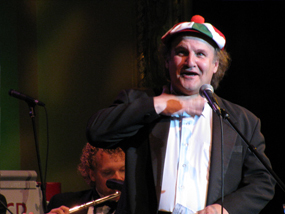 Tacca was greeted by the Paramount Center audience with rousing applause, wearing his trademark hat. 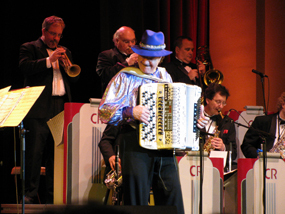 His fingers flying over the keyboard of the accordion, he brought the audience to their feet with his renditions of “Granada” and “The William Tell Overture.” Tacca was born in Assergi, a small town in Abruzzi, the region struck by the catastrophic earthquake on April 6, 2009. It was obvious that his dazzling performance was heartfelt and on this special night, connected to the victims of the earthquake. Vivino entertained the audience with his trademark humor, as well as masterfully emceeing the show. 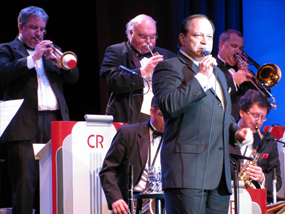 To the delight of the audience, singer Steve Ritrovato delivered his true renditions of songs made popular by Frank Sinatra and Bobby Darin. 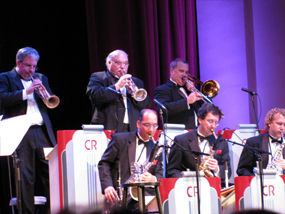 An integral part of the show, the City Rhythm Orchestra entertained the audience with their sophisticated and upbeat style of music. 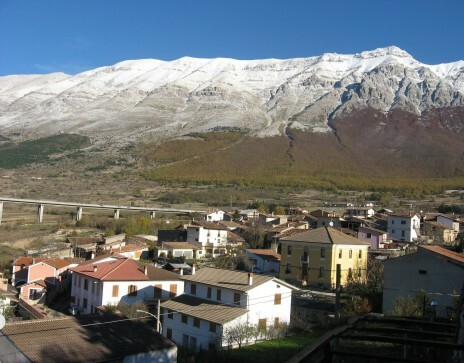 Mancini & Tacca prepared a video presentation, “Abruzzi, Before and After the Earthquake, 2009,” illustrating the devastation of the earthquake, and moving the audience to tears. The performers and organizers of this Benefit show donated their time and efforts to the success of this cause and are grateful for the generosity of so many. 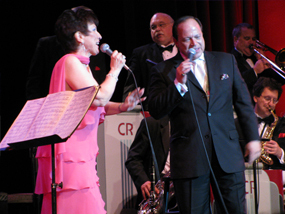 A reception at the Elks Club following the show allowed members of the audience and performing artists to share their vision to continue to aid the victims. he ABRUZZI EARTHQUAKE FUND is ongoing. Please make donations by check payable to “Abruzzi Earthquake Fund” and mail to 175 King St., Chappaqua, NY 10514.For your convenience you can use this form.